Coinrule is the prime tool for many different sorts of investors and traders. There is an unlimited range of options offered on our platform. You can test and develop your automatic strategies to create your own trading system and buy/sell OMG. It will be very easy to accumulate OMG, hedge your portfolio, secure any pump without missing a sudden drop down. Coinrule has one main mission, we want to make your trading activity more effective while being flexible. Cryptocurrency markets work 24/7, only an automatic trading strategy can fully handle any possible opportunity that will happen in the market. 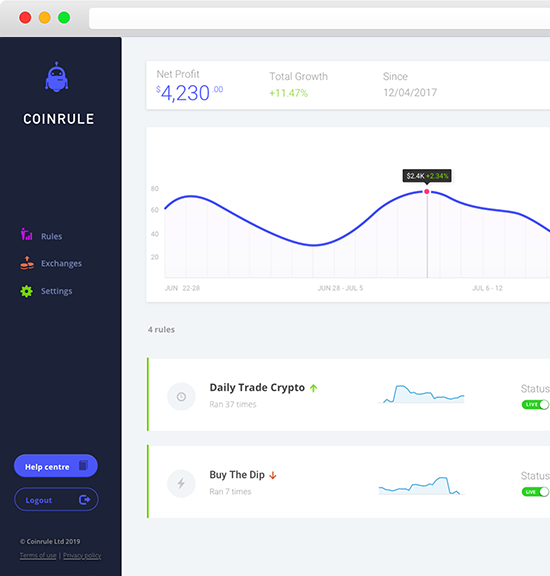 How to build a trading rule with Coinrule? Manage your automated strategies using the If-This-Then-That form, no coding skills demanded! At Coinrule we are working passionately to deliver new features and improvements to our environment every day. In fact, we are in contact with our most advanced customers and top exchanges to gather feedback and remarks. Trading needs discipline, attitude and plan. What does make trading so risky? The human nature and the feelings can negatively drive your trading gains. Using a automatic trading plan allows you to reduce the effects of concern, euphoria and greed that any client can experience. Also a beginner can trade like a pro with Coinrule! Receive free trading signals, defineautomatic trades and manage your allocation for 30 days for free.